-Cook up the ground turkey and add marinara and spices. Let simmer for the flavors to incorporate. In the mean time, take the tops off the peppers, slice them in half and de-seed them. -Add spinach to turkey mixture and stir until wilted. 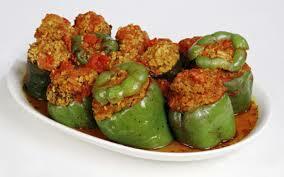 -Distribute the turkey evenly to the halved red peppers and bake for 25 minutes.